This blog post is primarily to explain and show the process of upgrading a Quad-sup 6807 VSS-cluster using the In Service Software Upgrade (ISSU) feature, also known as Enchanged Fast Software Upgrade(EFSU) in VSS terminology. The entire process is very painless as long as the cabling is done right. To achieve minimal and/or no downtime, everything connected the VSS-cluster must be dual homed. This is an obvious requirement, as the line cards will have to be reloaded at some point. There must at least be a connection from each supervisor to the other chassis. The VSL connection between the units must be present and best practice is to ensure both supervisors of both chassis is connected to the two other supervisors of the other chassis as depicted below. 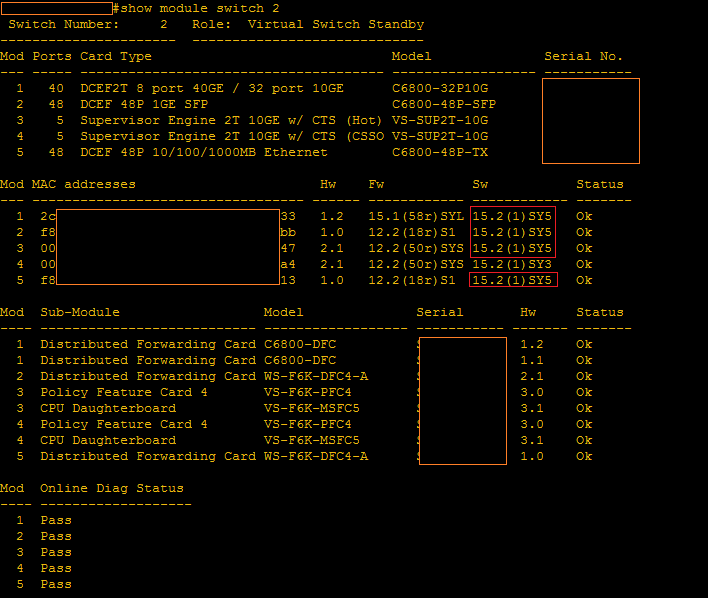 Not all images are compatible for such an ISSU-upgrade, but a spread sheet over software trains SX SY EFSU Compatibility Matrix exists at Cisco’s. The upgrade itself is fairly straight forward and relatively painless. In order to achieve mininmal downtime, you ought to use Staggered upgrade. Tandem/Dual Sup VSS upgrade is also possible, but will render one chassis down for the entire boot time of the supervisors. Staggered mode, which is the default mode for Sup2T, will reload one supervisor at the time. 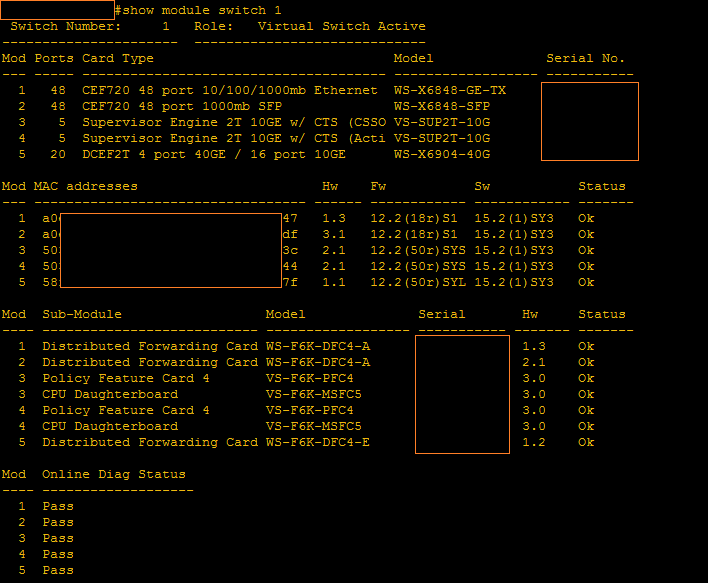 This means, when the line cards are ready to reload, there will already be a supervisor present running that version. 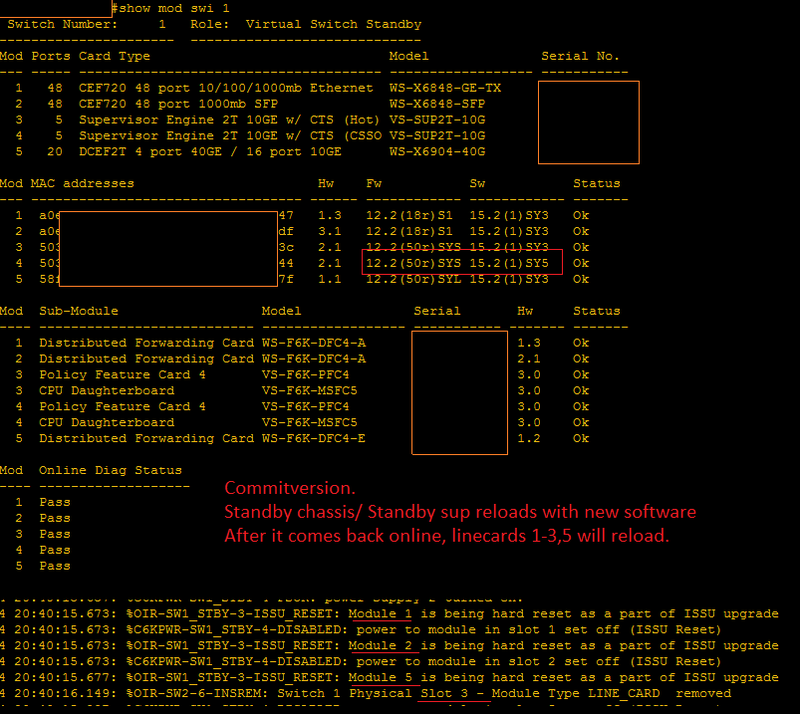 This gives the chassis a much smaller downtime, as the line cards reload much faster than the supervisors. It also means there will be a supervisor present running the old software, which gives a much quicker rollback time if need be. Copy .bin file onto bootdisk. In this scenario, we got a quad-sup VSS setup in slot 3 and 4, which means we got two chassis with two supervisors in each chassis. First of all we copy the .bin file over to the bootdisk of all the supervisors. Next we load the software file and now S-ICS will reload with new software. 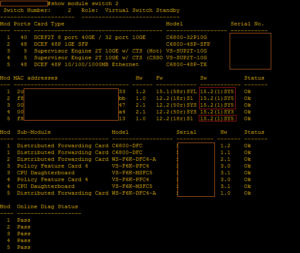 Linecards of Standby-switch also reloads with new software. When instructing the VSS-cluster to start running the new version, the active supervisor of active chassis reboots and the active supervisor of standby-chassis starts running. The chassis is now running new software and the Standby-chassis has become the Active-chassis. Unless we are now encountering any bugs, we accept the version. To finalize the upgrade, we commit to version. The redundant supervisor of the active chassis (Switch 2) reboots and starts to use new version. After that is done, the line cards, as well as the remaining supervisor, of the standby-chassis (Switch 1) reboots with new version. When the line cards are up, the last supervisor of the active (switch 2) chassis upgrades. Oct 4 19:45:15.996: %ISSU_PROCESS-SW1-3-LOADVERSION: Staggered loadversion sequence will begin in 60 seconds. Enter ‘issu abortversion’ to cancel. Oct 4 19:57:12.507: %ISSU_PROCESS-SW1-6-LOADVERSION_INFO: Loadversion has completed. Please issue the ‘issu runversion’ command after all modules come online. Oct 4 20:35:06.101: %ISSU_PROCESS-SW2-3-COMMITVERSION: issu commitversion; Staggered commitversion sequence will begin in 60 seconds. Enter ‘issu abortversion’ to cancel.